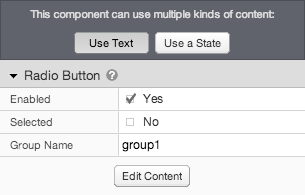 Create a single radio button based on text and manually-created groups. The text-based radio button creates a single radio button control, which you can use as part of a form. Multiple radio buttons can be grouped together to form a mutually-exclusive set of options. The label text is always displayed to the right of the radio button. If you want the label to be in a different position, or to have rich formatting, clear the text and use a separate component for the label. Enabled Whether the radio button is enabled. A disabled radio button is not clickable. Selected Whether the radio button is selected by default. Group Name Used to create a set of mutually-exclusive radio buttons. Add radio buttons to the same group by giving them the same group name. Only one radio button in a group can be selected at a time.